Tender Loving Care depicts a young girl caring for one of three baby kittens. 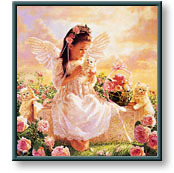 Image Size: 10 1/8" x 10"
Tender Loving Care copyright © 1997 by Jean Monti is prohibited from being copied. All applicable copyright © laws apply and are reserved by artist Jean Monti. Web pages copyright © 1998-2007 by Christ-Centered Art. All Rights Reserved.